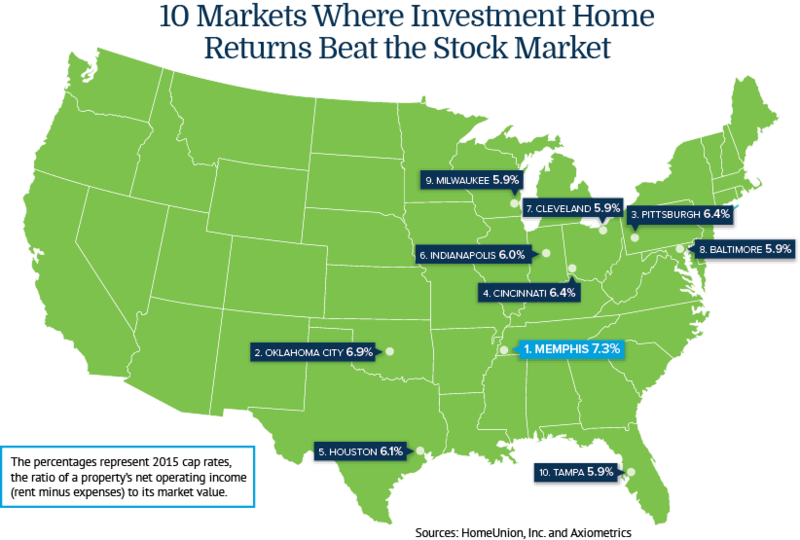 HomeUnion, an online real estate investment management firm, announced the best cities in which to invest in rental properties instead of the stock market. The firm found Memphis at the top of the list with a cap rate of 7.3 percent and San Francisco had the lowest cap of 2.7 percent. “Other asset classes underperformed in 2015, while single-family rental investors saw healthy returns in terms of income and appreciation in markets across the country,” explained Steve Hovland, manager, research services at HomeUnion. Baltimore was ranked one of the best markets for investment properties, with a cap rate of 5.9 percent. The worst cities for investment properties list is populated by a majority of California cities, including San Jose, Los Angeles, Oakland, San Diego, Sacramento and all of Orange County. Other cities include New York City, Seattle and Portland.